Best free online survey software tool! Create free online surveys! Survey Expression. Online survey software. Professional web based questionnaires. Build powerful online surveys in minutes with an easy to use survey editor. 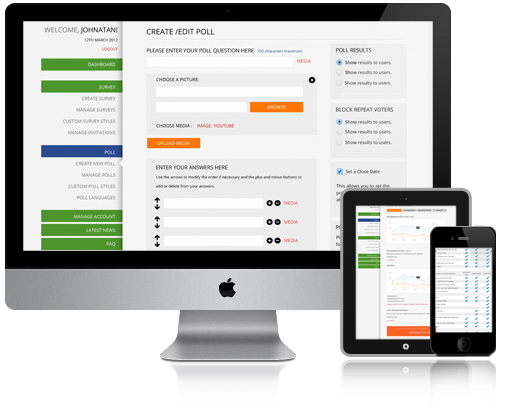 Survey Expression will help you design smart and beautiful online surveys in our web interface. Advanced features are just a click away. Collect responses by sending email invitations or by placing a link to your survey on any website. SurveyExpression offers a wide range of data collection channels which enable you to collect answers fast from your target groups. View your results as they are collected in real-time using our reports. Use our reports to summarize and analyze your responses. Dig down to a specific answer. Export your data if you want to process it offline using tools like Excel or SPSS. Survey Expression is hosted in a secure location. Our software infrastructure is updated regularly with the latest security patches and permanently tested. The site is constantly monitored, up and running at least 99% of the time. It's never easy to have people answering your survey. Check out this article about how to increase your response rates. Learn how you can prepare your online questionnaire. How to conduct an online survey. Take a look at our survey samples related to customer satisfaction. Take a look at our survey samples related to human resources. © 2019 Survey Expression by Outside Software Inc. All rights reserved.